Established since 1976, Tanda Tula was the first East African styled, luxury tented safari camp in South Africa, and it is still recognised as one of the best. Located on the banks of Limpopo's Nhlaralumi River, in a premium position between a watering hole and a dry riverbed, Tanda Tula is shaded by a canopy of mighty trees. Situated amidst 20,000 acres of wildlife rich bushveld in the Timbavati Game Reserve, part of Greater Kruger National Park, Timbavati Reserve plays host to phenomenal concentrations of Africa’s game, including the famous Big Five, and is renowned for its numerous lion prides especially the famous rare White Lions of Timbavati. Guests at Tanda Tula enjoy the intimate experience of being surrounded by nature, being immersed in the ambiance of an authentic safari and the excitement and uniqueness of the African Bush. With not a fence in sight, much of the wildlife makes its way through both camps, offering guests an opportunity to get even closer to nature. Tanda Tula means ‘love of the quiet’ and all that can be heard is the sound of the wild; elephants, buffalo, hyena, the occasional lion and the twittering of birds. Tanda Tula offers two exclusive camp experiences; the Safari Camp and the Field Camp. The Safari Camp comprises twelve luxury safari tents which are completely private and surrounded by riverine bush with a deck overlooking the riverbed. The Field Camp is more of a ‘glamorous camping’ experience, with just four beautiful tents for an exclusive, private safari adventure. The Greater Kruger National Park is a vast wilderness of more than 3.5 million hectares, and, as there are no fences between the Timbavati and Kruger National Park, game are able to roam freely between the two, offering guests an incredible African wildlife experience. Tanda Tula’s highly skilled ranger and tracker teams guide guests in the early mornings and evenings, on game drives in open safari vehicles or on foot, providing the perfect opportunity to get up close to African game. Guests are likely to spot a variety of wildlife including elephant, lion, leopard, buffalo, rhino, zebra, giraffe, wildebeest, kudu and the rare wild dogs. Nocturnal sightings might include bush babies, the elusive genet, or predators hunting and stalking their prey. Tailoring game viewing to guests requirements, the guides and trackers offer informative, exciting and unique game viewing experiences while respecting the animals at all times. The rangers at Tanda Tula have specialist knowledge of wildlife conservation. Since 2003, Tanda Tula has served as the main sponsor for Save The Elephants South Africa, which tracks the movements of elephants in order to enable the reserve to make informed management decisions. Tanda Tula is the first in the Timbavati Reserve to offer a unique, ‘Overnight Walking Safari’ experience, providing an opportunity for nature-lovers and adventure seekers to experience African wildlife on foot and up close, and to sleep under the stars. Guests can arrange to spend an incredible night out in the bush at Machaton Hide, overlooking the spectacular watering hole on the banks of the Machaton riverbed. Machaton Hide is a double-storey wooden structure located high up on stilts, with the top floor as the sleeping area and the lower floor utilized for storage. 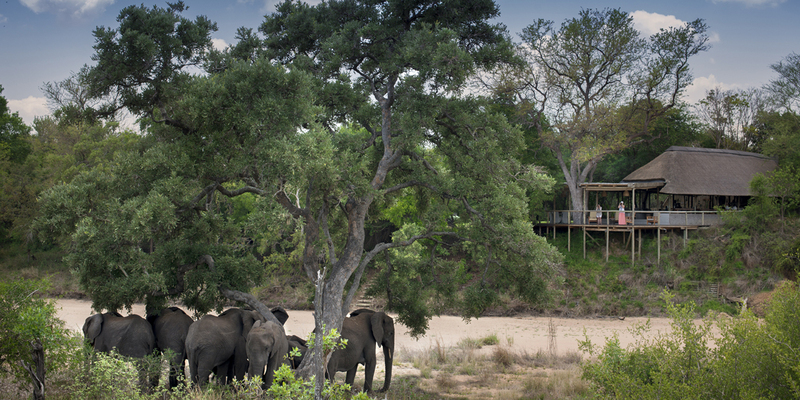 The hide accommodates a maximum of four guests and is only available to couples or friends and family travelling together. After an evening game drive, guests are taken out to the hide with a delicious packed picnic dinner. A game viewing spotlight helps to spot the nocturnal visitors to the dam, and a radio with direct connection to the camp will ensure security and safety. Tanda Tula Safari Camp consists of twelve secluded, luxury East African-style tents, on raised wooden platforms and covered by a thatched roof, all with breathtaking views. Each deluxe tent features an en-suite bathroom, bathtub, outdoor shower and a spacious private deck overlooking the riverbed and African bush. The interiors are decorated with elegance and comfort in mind to ensure that guests enjoy a pleasant stay in complete luxury. The main thatched timber lodge is warmly furnished, and houses a spacious open-air sitting room and dining room where guests can relax near the crackling fire and catch up with friends or other guests. Bush breakfasts are a superb way to end the morning game drive. Set out on the banks of the riverbed, the chefs prepare an extensive continental buffet and a cooked English breakfast feast. Lunches are set up in different locations in camp daily. When guests return from evening game drives, open-air dinners are served either around the log fires in the traditional boma, in the garden under the stars, or by the riverbed, which runs alongside the camp. Tanda Tula Safari Camp features an outdoor infinity pool in the main area overlooking a water hole, replete with buffalo and elephant coming down to drink, and a bar is situated close by for an afternoon cocktail. Guests may spend a lazy afternoon lounging by the pool or enjoying a refreshing dip. There’s a small viewing hide down at the water’s edge which offers incredible close-up photo opportunities for guests. There is also a private, open-air spa hide at the edge of the watering hole where a range of aromatherapy treatments are offered. At Tanda Tula Safari Camp there’s also a gift shop featuring safari clothing, as well as arts and crafts from the region. For families and friends looking for complete privacy, the exclusive Tanda Tula Field Camp is perfect. Featuring four custom-designed explorer tents and accommodating up to eight guests, it operates from the 1st of March to the 31st of October annually. Each tent has its own outdoor bathroom with hot water bucket shower, eco-loo and amenities. This exclusive-use camp is set up and taken down based on the requirements for each booking, and the locations will vary throughout the year depending on the seasons and game activities making it completely eco-friendly with absolutely no impact on the environment. The camp features an elegant mess tent with a full field bar and campaign styled furnishings. There is no electricity. The camp features oil and solar lanterns. With a private guide, chef, camp host and dedicated camp staff, activities can be arranged on a whim, and game walks and drives may be as long or as short as guests require. There is no swimming pool as this is a non-permanent field camp. A minimum stay of 3 nights is required for all bookings. Guests must be walking fit and should be able to manage a 10 mile walk.